Does your Valentine love to paint her nails? Maybe she loves to paint your daughters nails. Either way, Tweexy is the perfect gift for her. One of the problems when painting your nails, or even someone else’s nails, is the bottle. Trying to hold the bottle, and then painting someone’s nails is tricky. You often need one hand to paint, and the other to help hold their hand. But then your bottle is out of reach. If you’re painting your own nails, it’s often tricky to hold onto the bottle, while keeping your hand steady so you can apply the polish. If you’ve ever painted nails, you know the struggle. If you haven’t, take my word for it. That’s where Tweexy comes in. 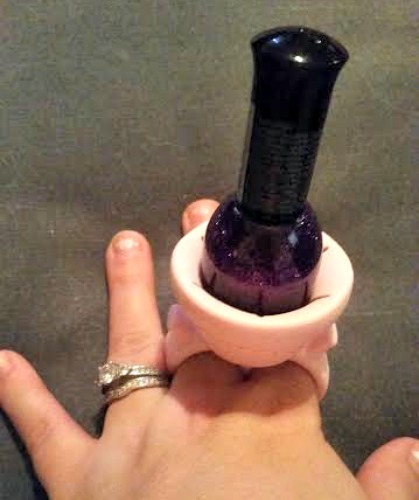 It’s a wearable nail polish holder that’s super easy to use. It’s one size fits all fingers, and all bottles. Even the oddly shaped ones. I added pictures of mine with a “standard” bottle, and then the biggest, most oddly shaped bottle of polish that I have. As you can see, they both fit into it with ease. It even holds them steady so there’s no worry of spilling and making a mess. That’s a huge bonus in my book, as I’m sure it is in yours as well. I tried mine out the day I received it. I absolutely love it. Now I can’t imagine giving myself a manicure without it! Where has this been all my life? Take my word for it, if your Valentine loves to paint her nails, or those of others, she too, will love Tweexy. With seven different colors to choose from, you’re sure to find one to please her. Mine if pink frosting. There’s a brighter pink, two blues, two greens, and a lilac colored Tweexy. My son even found his own use for my Tweexy. He wanted to paint today and used mine to hold his bottle of acrylic paint. It worked great for that too! To get her a Tweexy, head on over to their website, or to Amazon. You can also follow them on Facebook, Twitter, Instagram, Pinterest, YouTube, and Snapchat!